Blackberry Goes To Chile | BlackBerry Blast! The Blackberry continues to be introduced to country after country around the world. Today the Blackberry is in Chile. Entel PCS and Research In Motion today announced plans to introduce BlackBerry® to mobile professionals in Chile. BlackBerry, developed and manufactured by RIM, is a wireless communications solution that provides always-on, push-based, mobile access to e-mail and other communications and information for both individuals and corporate customers. Entel PCS will initially introduce the BlackBerry 7230 Wireless Handheld™ which will operate on the Entel PCS GSM/GPRS network. "We are pleased to work with RIM to offer BlackBerry, providing our customers with mobile access to communications and information while on the go," said Carlos Rodríguez, Products & Services Manager of Entel PCS. "Entel PCS is the first carrier in Chile to offer BlackBerry, a demonstration of Entel PCS’s ongoing commitment to providing popular and innovative solutions to its customers." 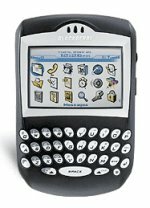 The Java-based BlackBerry 7230™ features support for phone, email, text messaging, web browser, organizer and corporate data applications in a single wireless handheld. Integrated attachment viewing includes support for popular file formats such as Word, Excel, PowerPoint, WordPerfect, PDF, and ASCII, JPG, GIF, BMP, PNG and TIFF images. The handheld also features a high resolution color display supporting more than 65,000 colors, excellent battery life for optimal performance, a small form factor with a light and comfortable feel, and an easy-to-use thumb-typing QWERTY keyboard. The BlackBerry 7230 also features tri-band support, allowing international roaming. This BB is a favorite of Jennifer Hee who uses a BlackBerry exclusively. "BlackBerry is a popular and proven wireless communications solution, adopted by more than three millions subscribers around the world. It provides an optimized mobile experience for email, phone and data applications," said Mark Guibert, Vice President, Corporate Marketing at Research In Motion. "We are very pleased to work with Entel PCS to bring BlackBerry to Chile."